Everyone has their own childhood food cravings. It is the food they grow up with and it reminds you the memories of the past as you eat them. I grow up eating lots…, I mean lots of this dish. This is one of my favorite snacks when I was a teenager (I have lots of other favorites, too). This dish is called Ddukppoki (떡볶이), the spicy Korean rice cakes. As a teenage girl in middle/high school(I attended girls only school, no boys there except teachers), I had to wear school uniforms, white blouse with black overall skirt and navy canvas shoes. The skirt should cover your knees completely. No girls liked wearing uniforms. There was no unique individual style whatsoever. Every girl looked exactly the same, only different in sizes. Our school had very strict rules over its dress code. Not only the dress, the hair style too. Every one had a exact same hair style. A simple black hair pin on one side of your head to hold the hair and the straight hair line that should sit just below your ears. No more than 1″ below the ears! No bangs, No make up, and No perms are allowed. If you violate any of this, you will get kicked out of school, period! There are lots of fun stories that associated with this dress/hair code, but I will share the stories some other time. Things change! Korean school girls these days still wear uniforms but they get to have free hair styles and some even wears make up. I don’t think I ever showed my teenage photos to my piano man. I looked hideous on the photo, and every girl did look horrendous as well, whether they are very pretty or less pretty. It is the one evidence of my past that I would like to bury on the ground forever! So I would like to share with you how you can recreate this dish at your own kitchen. This can be quite spicy if you are not used to the spicy Korean food. Burning sensation in your mouth! Besides serving this dish can be a good way to revenge your husband or boyfriend who forgot the important date… Let him burn! Korean chili paste, sugar, dried sea kelp, dried anchovies, garlic, leek, cabbage. 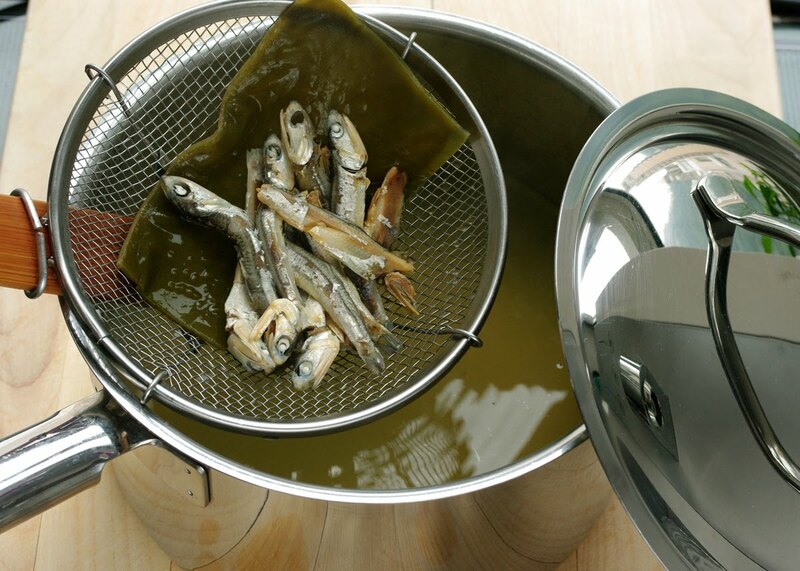 First, you dunk anchovies and sea kelp in the water to make stock. Let it boil and simmer for 10 minutes. Remove from heat and set aside. 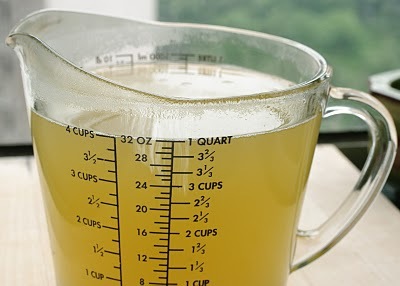 The stock will get more intensified as you let it sit, about 15 minutes. Remove our ocean friends from the pot. Reserve 4 cups of stock. 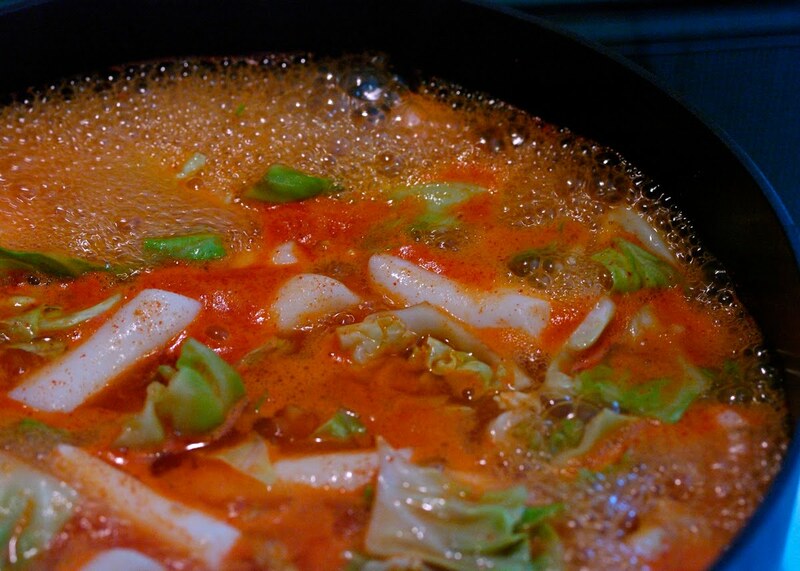 This is a basic stock for most Korean soups or stews. The queen of Korean flavors! My royal highness! 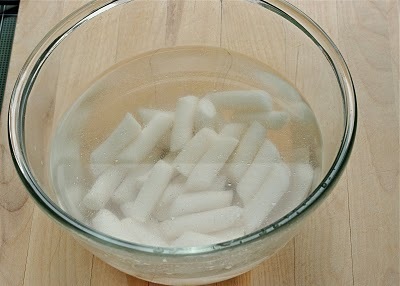 Soak the rice cakes in the water to soften. But do you see the oil floating on top? They are coated with oil to prevent them from sticking for packaging. just blanch in the boiling water for 30 seconds. Dice the cabbage beautifully like I did. 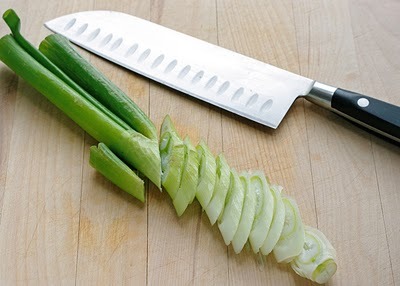 Slice the leek as you’re humming like a bird. 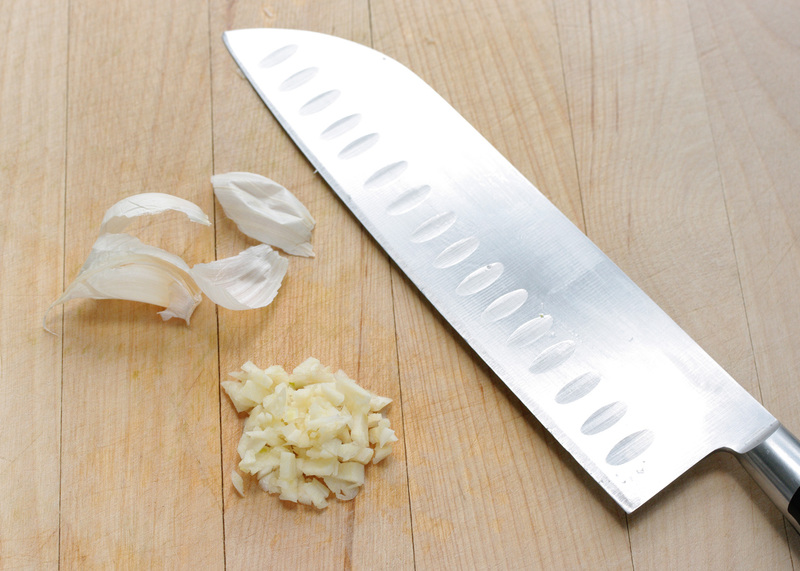 Chop the garlic as you hit the high note on O Sole Mio! This is optional but you will like the addition of the fish cakes. Use your ruler to cut exact dimension like I did. Pour the reserved the stock in a non stick pan. Add chili paste to the pan. Now, if your husband or boyfriend forgot your important anniversary, add 4Tbsp chili paste. If he forgot your birthday…, then add 6Tbsp or more! Smear the paste with spoon to mix in with the stock. Place the pan over medium heat. Add rice cakes and cabbage. until the rice cakes and the cabbage get soften. The sauce will get slightly thicken, too. until the sauce gets really thickened for your liking. Add the leek and mix in well. Now this is something you don’t have to add but I recommend you to try. Add 1 or 2 Tbsp of ketchup at the end. It will bring subtle tang to the sauce and adds beautiful deep orange color. Lastly crack some peppers and sprinkle some sesame seeds. Stir them well and it is ready to serve. Sometimes I like being an happy pig! …and burped a couple of times after… Oh, my! and thought about my high school friends. I am sure they all became Ajumma (아줌마) and live somewhere in Korea. An important Korean vocabulary to learn! and carrying a Louis Vuitton bag. But don’t you dare to call me Ajumma! To make stock pour water in a pot, and add anchovies and sea kelp. Boil first and then reduce the heat to low. Cover and simmer for 10 minutes. Remove from heat and let it sit for another 10-15 minutes to get the full flavor. Reserve 4 cups. Soak the rice cake in the water for 5 minutes. 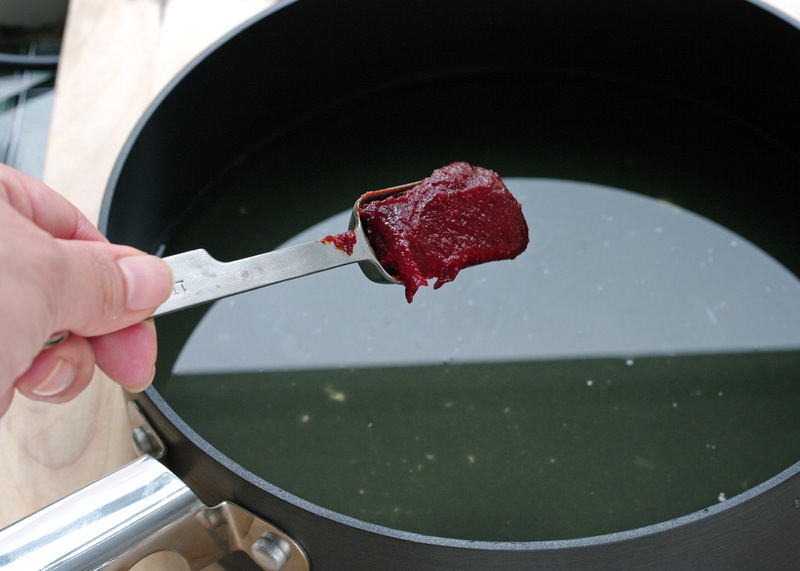 If you want to get rid of the coated oil, blanch them in the boiling water for 30 seconds. 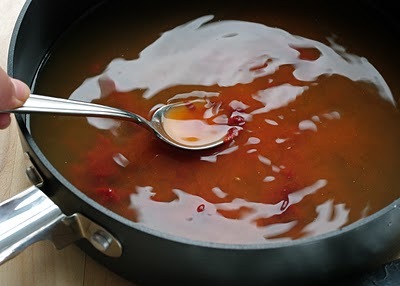 Pour the stock to a non stick pan and add the chili paste and sugar. Mix well. 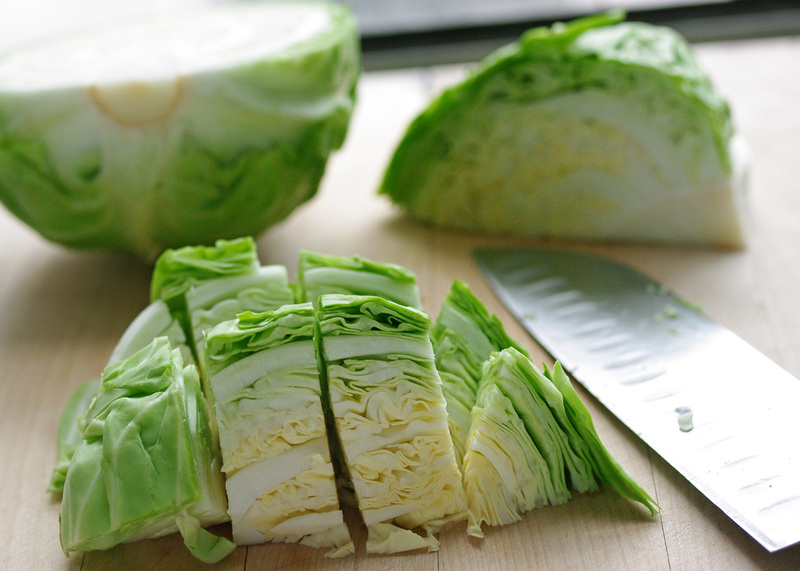 Add rice cakes and cabbage. Boil over medium heat, reduce heat to medium-low, simmer uncovered until the cabbage gets soften and the sauce gets thicken. Add the fish cakes, if you wish, and garlic. Continue to simmer for another 10 minutes until the sauce gets well thickened to your liking. 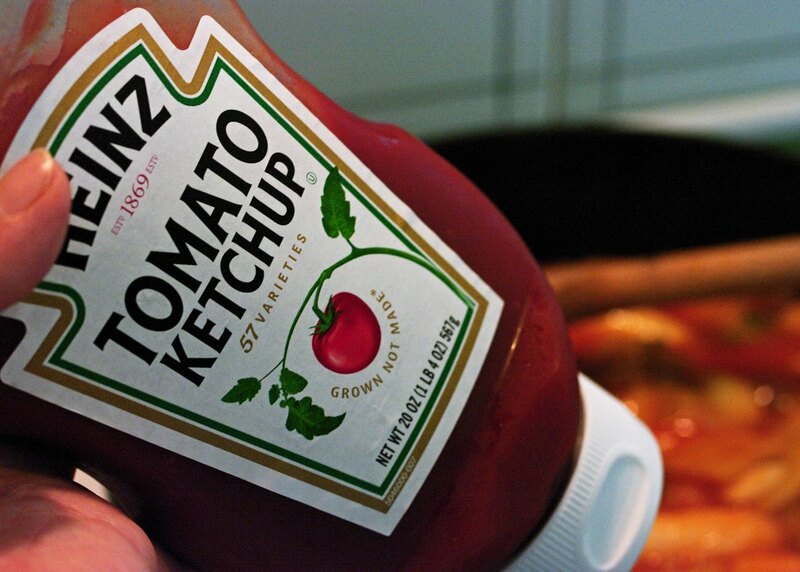 Add ketchup and stir well. Sprinkle some peppers and sesame seeds. Good to serve hot right out of pan. Napkins are a must! While I didn't grow up in Korea, I definitely grew up in a household where ddukppoki was a staple. Now, whenever I go home to visit the family, my mom makes me be the one to prepare and make this dish! Mmmm, I may have to go buy some dduk tonight and make it tomorrow! I'm bookmarking this recipe: thanks! Thanks for visiting my blog. Hope your Ddukppoki turned out good. I can't wait to try making this tasty-looking dish!! Thank you so much for posting this recipe! My Dad lived in Korea and when I went to visit him this was my absolute favorite dish. Now I can't wait to get the ingredients together and make it for my boyfriend. I would love to hear how you and your boyfriend like it. Thanks for visiting my blog. I love all types of Korean food! This looks so good! I'm glad that I found your blog! Does the cooked rice cakes keep well overnight in fridge? If reheated will the texture change? You might want to add a tablespoon or two of water and cover with cellophane before microwaving. This will help rehydrate the rice cakes. oh I always love the redness in Korean dishes. So appetizing! Thanks for sharing this great recipe! About the rice cake, is it the same with mochi? Thanks for your fast help! Actually I had the same frozen ones as shown in your picture. But when I soak them they crack up. 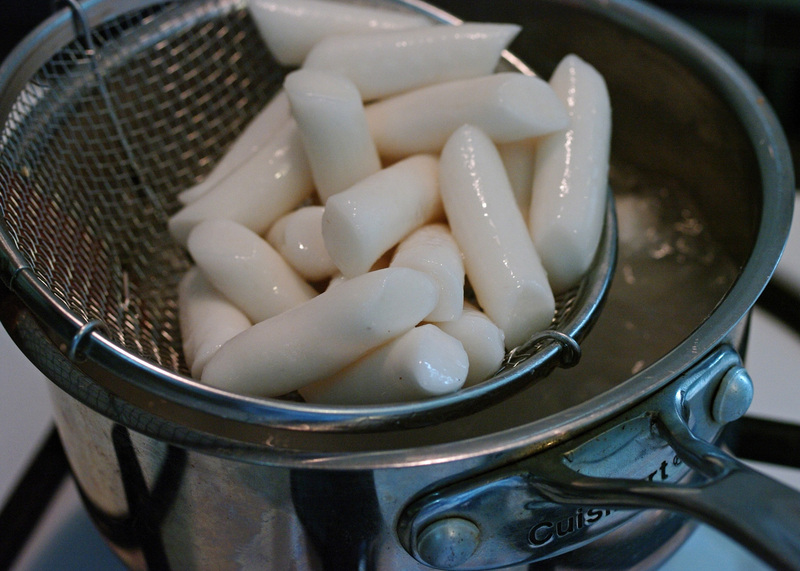 I also made tteok myself (poor attempt) and froze them for later and I have the same problem with them. Maybe some kind of storage problem? Or it depends on the temperature of the water?. Do you let them defrost slowly before you soak them? This is what I always eat when we went to Korea! It is really delicious especially the spicy one! Koreans have this really nice taste when it comes to sauces. how would you incorporate the ramen noodles instead of the fish cakes? Add the ramen noodle when you add the rice cakes and cook them together. Thanks! Everybody loves rice cakes. It is spicy but so good! Can I use some water and fish sauce instead of making the anchovie stock? sauce, it will make the dish very very salty. If I were to make a bigger batch, say for about 8 people, I just have to double everything, right? Including the amount of anchovies for the stock? And also, can I skip the sea kelp and just have the anchovies? You can double the recipe but reduce the amount of the stock and the chili paste a little bit first (by 1 1/2X instead of 2X). You can always add more if you need. You don't need to add kelp. Anchovies alone can bring wonderful flavor. Have fun making them and let me know how it turned out. lol, can I change the fish cakes and stock for chicken, because I'm allergic to sea food. Yes, you can change to chicken stock, but use low sodium one. You might want to reduce the chili passte just a little since most store bought chicken stocks have lots of sodium in them. Hi, I just made this dish now but found that it was too watery. I think maybe I put too much water in the pan. Love your blog. Hmmm, I'm sorry to hear that it was watery. It should be somewhat saucy but not watery though. I wonder it there was too much stock/water. 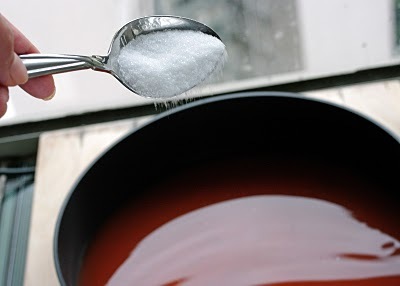 Reduce the amount of liquid a little and cook up the liquid over higher heat, UNCOVERED. The sauce should eventually thickens and be able to coat the rice cakes over all. Hope this helps. Please let me know how it turns out next time. I like the symbols you have on the site. What are they called? Would like to decorate my walls with them. I Loved your blog. Not only the dishes looks inviting but very entertaining too. I've been dying for rice cake since last week. Went to H-Mart in Irvine while visiting my daughter at UCI and was looking forward to buy the spicy fried dubokki but they were out of it at the ready cooked section. Ended up buying the rice ovalette and gochujang sauce but not sure how to cook them until I saw your blog. I am going to try to cook them today. 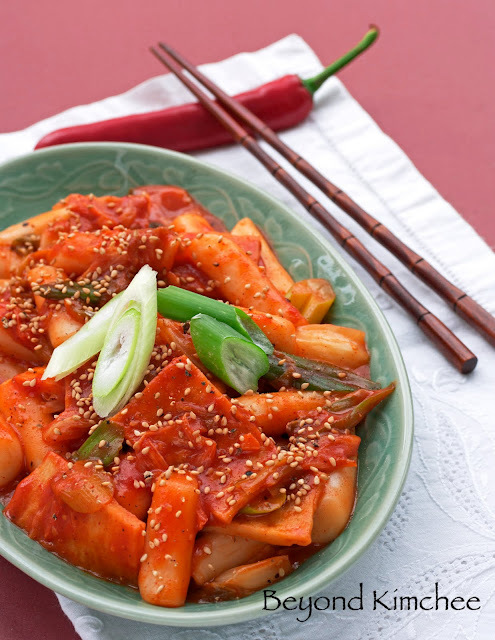 Your recipe uses the long rice cake, is there any difference from using the oval type rice cake? 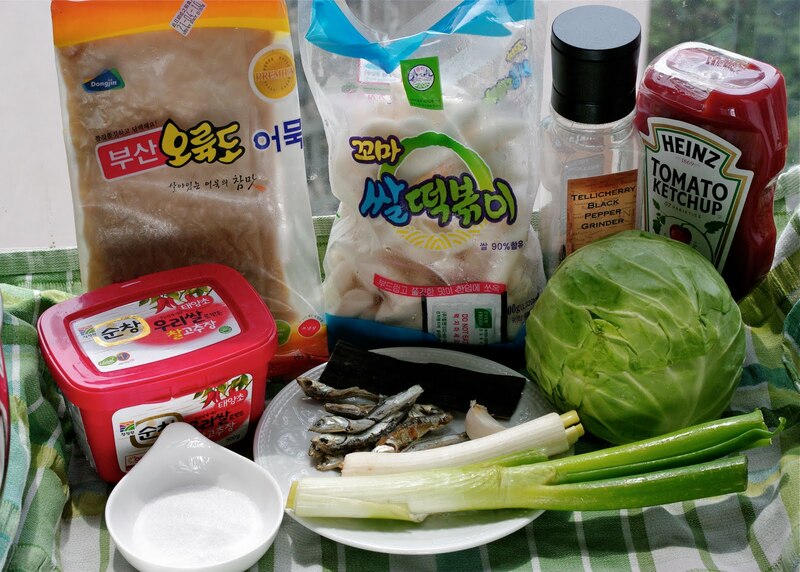 Before your blog I found an Ahjushi's blog but he didn't use enchovies and kelp but instead uses chicken stock. You can use chicken stock but it will bring slightly different flavor. Use low sodium chicken stock since the chili paste already has some sodium in it. 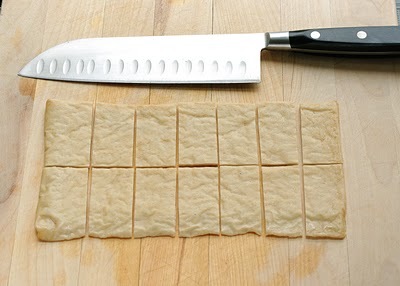 Also you can use the flat rice cake slices as well. But reduce the amount of liquid into 1/2. The will get cooked faster. Great dish... I made some substitutions, using chinese xo sauce instead of anchovies, etc... still turned out delicious anyway! Hi! First of all, i would like to say thank you for making this blogspot! 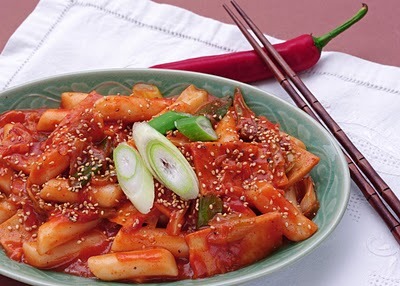 i absolutely think your dishes look amazing and would like to try these rice cakes as soon as i can, i am not near a korean market and i currently have 'chili paste with soy bean oil' can i substitute this spice for the korean chili paste?? Hmmm..., I have to say NO for substituting chili paste with soybean oil for Korean chili paste. They are different. If you are not near Korean market, try ordering online. Amazon carries Korean stuffs and Hmart has their online shop as well. I found Korean chili paste at many cold storage stores in KL. Unfortunately there is no substitute for it since it is unique to Korean cuisine. do you have to make/use stock? You can use plain water. However stock will bring more flavor to the dish. 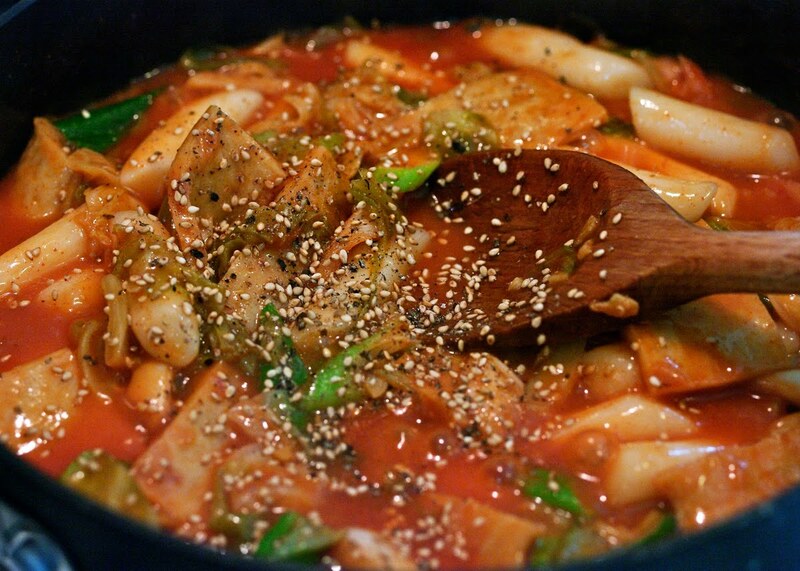 do you have any idea where to find it here instead of making the rice cake. There are several Korean groceries in Ampang and Mont Kiara. You should be able to find some there. You can skip the anchovies. I wouldn't use anchovies in a can. It will have some liquid in the beginning stage. You just to have to continue to cook off the liquid over high heat once everything is soft, if you prefer the thicker sauce. Hope you get to give it another try. Thank you for posting this! It helped me a lot. My parents praised me and my sister cause we cooked this dish well.. :p I tried to make this dish by myself for my friends and they said it was good ^_^ Thanks so much! hi! I am from malaysia, i live in selangor....where can I buy the korean chili paste in selangor? Hi Munirah2 I don't know much about Korean stores in Selangor. If you have chance to visit KL, There are many Korean groceries in Ampang and Mont Kiara area. I am a white Jewish female and I LOVE, LOVE, LOVE making and eating Korean food! My pantry and refrigerator are filled with Korean products! There are many Asian markets and a huge Korean market close to where I live so making these recipes is really easy. 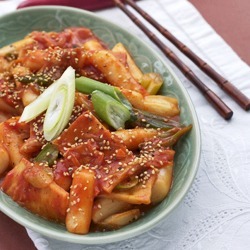 I am definitely going to make the Spicy Korean Rice Cakes tomorrow! I've eaten the fish cakes, they're delicious, so I'll be adding that to this recipe too. That addition should make this recipe really, over the top, delicious. I can't wait to eat this!!!! Thanks so much for this blog. There is an explosion if deep-frying the rice cake. Why does that happen? 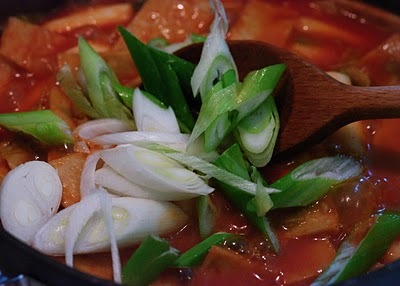 It is dangerous to deep fry this type of rice cakes. When oil gets relly hot it will sear the surface of the rice cakes and the cake expands due to the heat. The moisture inside rice cakes will come to the surface of the cake and contact the hot oil. Boom! It will explode! Do not deep fry rice cakes! I bought some rice cakes 3 days ago from the Asian shop (I'm in New Zealand). They don't have an expiry date on them but have gone rock hard in the packaging. I am sure they were softer when I bought them. Are they still OK to use? How long will they last in the fridge and if I freeze them will they change consistency? Thanks for your help. Hi Anne They are still usable. Soak them in water for a few minutes first before you add to this recipe. The best way to keep rice cakes is freezing them. They can last quite a while, about 3 month in the freezer. Thank you for your blog Every recipe looks wonderful (without meat) I especially love spice-y food. I have only eaten Korean food bought from the store. I am definitely pinning you! Thanks Holly, I went to Bucheon and Jeju a month ago for my New Zealander son's wedding to a lovely Korean lady, certainly not Ajumma (and I wouldn't call anyone anything at all in Korea, having navigated a family home meal with trepidation and still hoping that we weren't considered barbarians). We were very much hosted and I didn't have a chance to strike out alone, so missed Ddukppoki. I've walked past a restaurant in Strathfield, Sydney Australia which advertises DDukbboki and (being a barbarian again) thought that it was just a catchy name. Now I get it. There did seem to be quite a few chic young Korean teens in proximity. so traditions live on despite the Macjunk chain. Just down the street from the aforesaid I found all the ingredients easily, Strathfield being one of Sydney's little Koreas. One question: A few weeks ago I bought from Sydney city Chinatown some anchovy soup stock from Korea which is a powder. I also have whole anchovies which I bought to make that fried side dish. Which would be better for Ddukppoki? Or perhaps no difference? Hi Ross Thanks for your comment. Ddukbboki is perhaps one of the *must try* street food of Korea. Hope you get to try soon. To answer your question, the powder form of anchovy stock, some has MSG and some don't. Check the ingredients in the back. I normally don't use the powder form of anchovy stock base but if MSG doesn't bother you, it makes decent stock. The small dried anchovies for fried side dish, if they are the tiny kinds, they won't make much flavor to make stock unless you use tons. So I would save them to make side dishes. If you are planning to make authentic Korean foods often, I would recommend to get some med-large size dried anchovies. 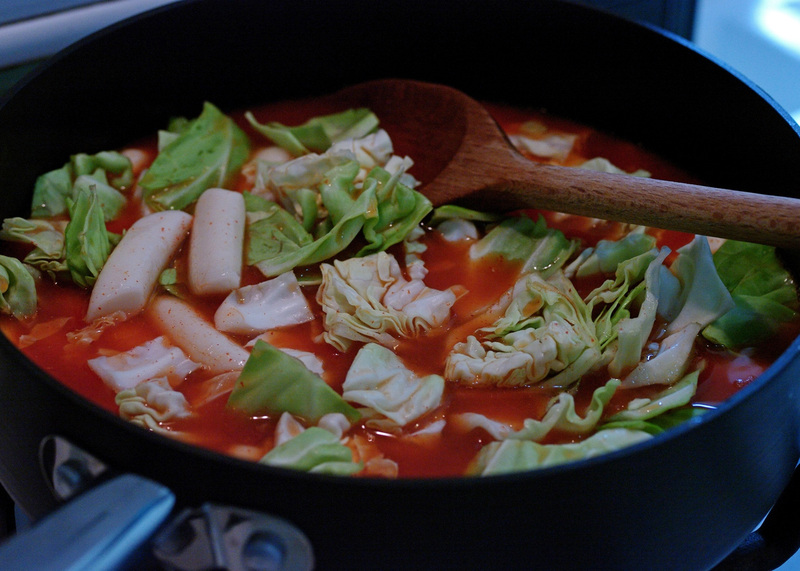 Koreans use them often to make soups, stews, kimchi filling etc. You will find that I used them very often in my recipes. I chuckled a little when you mentioned Barbarians. That is funny description. Pardon the delay. I found the rice cakes in the second Korean shop from the railway station along the Boulevard in Strathfield, passing the restaurant that sells Dukkbokki as a dish. The more extensively stocked Korean supermarket inside Strathfield Plaza has rice cakes too. Not so long ago this supermarket had fresh jujubes, which might excite our blog host. The Thai Kee IGA supermarket in Haymarket, Sydney CBD (Level 1 Market City) has them too as well as a limited range of Korean foodstuffs. All the rice cakes that I have seen in Sydney are made in Australia, they do work so I guess that they are satisfactory. Another thought: Very close to the Thai Kee IGA supermarket and on the same level is a liquor shop called "Red Bottle" that always has Soju and other Korean liquors including Bek Se Ju, which I understand (Holly, correct me if necessary) is a way of obtaining a ginseng hit. The liquor shop in the Boulevard in Strathfield a block or so from the grocery is also well stocked with Korean liquor, in contrast to its ocker days when it was beer, wine and whiskey on the shelves. HI! I loveeeeee the rice cakes but just need to know how can I store them overnight as i"ve made too much. And will it be good after I've reheated them the next day? Thnkas! Unfortunately leftover rice cakes are not that great in terms of the texture once chilled with sauce in the fridge. You can reheat but they won't taste the same. Hi! I made this dish a couple days ago and the flavor was delicious...but my rice cakes were kind of soggy :( Do you know why? I didn't make the broth in the first step (i just used stock), so rather than soaking them in the hot broth for 5 minutes, I soaked them in instant hot/boiling water from my tap for 5 minutes. Now I'm confused what water you actually soaked yours in...just regular tap water?? Thanks! Hi Amy Is your rice cakes fresh kinds (never been chilled or freezen)? Because you don't need to soak fresh rice cakes since they are already soft. If your rice cakes are frozen, it might be that your rice cakes are not made of 100% rice. Some rice cakes contains wheat and they can be soggy after a long soaking or braising. Check the ingredients on the package. I soaked mine in regular tap water(hot). Thank you for your reply! I think maybe the water I soaked it in was too hot! They were frozen, but I"ll have to check if they were pure rice. You have a great website! Quick question, your recipe is for the frozen rice cakes, I was able to buy fresh ones, how should I cook them? Should I add them after the sauce has thickened and cook for about ten minutes, or wait until the last minute? Thank you! 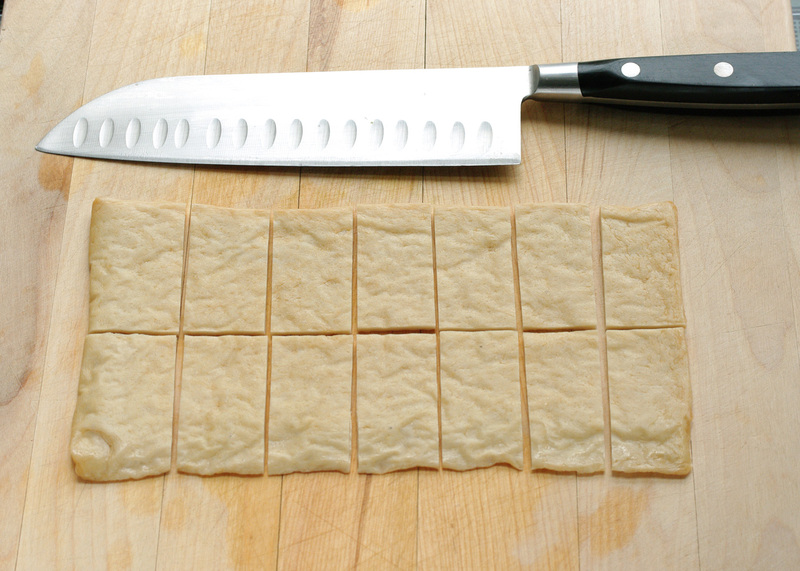 If using fresh rice cakes, reduce the amount of stock by 1/2. You don't need to cook that long as it is written in the recipe. Other than that, you can simply follow the direction. Hi, this sounds like a tasty and great recipe, however, I'm studying in the UK in an area where there is two tiny asian markets. 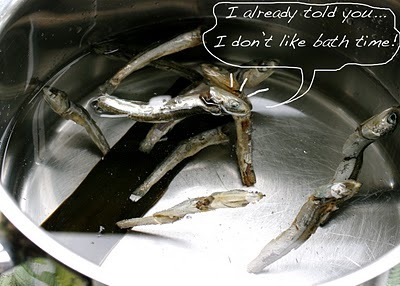 I couldn't find dried anchovies, is there anyway I can substitute or buy a stock which will resemble. I really would like to make my own stock but unfortunately I'm limited at the moment from ingredients. You can use the dried sea kelp only if you can't find the anchovies. You can also use powdered form of dried anchovies but make sure it doesn't have too much sodium in it. I ate this for the first time today after being in Korea for a week. I loved it so much that I ended up here ! I can't wait to visit my family back in Europe and cook this for them ! They're going to love it (I just hope they have the ingredients at the asian supermarket). Thanks for the recipe ! Just made this dish; it's the first Korean dish I've ever made and I'm quite thrilled with the results. Awesome, thank you. I added a few squirts of toasted sesame oil near the end, which was a great addition. It's my favourite secret ingredient. Hi hi! I love rice cakes!! And I really enjoyed this blog post of yours. You have a very interesting sense of humor! Hehe will definitely try out this recipe soon!!! Did you use frozen cakes? If using frozen cakes, soak them in water for 10 minutes before adding to the recipe. They tend to get hard faster than fresh kind so they need longer cooking time. Thank you very much for your reply, holly!! I will soak them Nx time before is cook them. I visited some friends in Korea this past spring and I am HAUNTED by this dish. I could not get enough of it. I almost got it from every vendor who sold it! 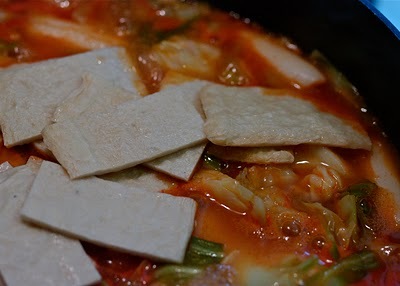 There are a few local Korean restaurants where I live in the mdwest and I order this (or a similar stew with rice cakes and ramen) as an appitizer every time. I am going to make this over the weekend. Thanks for sharing your recipe! Hi, thank you for the recipes :) Could we replace the stock of anchovies and sea kelp with mix of water and chicken powder (the one from Knorr)? Thank you. You can just use plain water. I NEED immediate HELP! If I bought Korean Rice cake (Garaettok) to make Ttoboki or dak galbi how long can they last outside of the fridge? or should they be kept in the fridge all the time?? OMG Your writing style makes these recipes so fun to make! I absolutely love Korean food and I'm glad I could find your blog. Definitely bookmarking this deliciousness. Thanks!